China has hoisted the final piece into position on what will be the world’s largest radio telescope, which it will use to explore space and help in the hunt for extraterrestrial life. 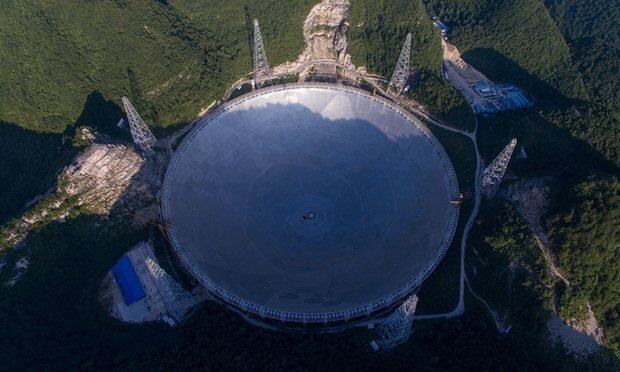 The Five Hundred Metre Aperture Spherical Telescope, or Fast, is the size of 30 football fields and has been cut out of a mountain in the south-western province of Guizhou. Scientists would start debugging and trials of the telescope, said Zheng Xiaonian, deputy head of the National Astronomical Observation under the Chinese Academy of Sciences, which built the telescope. “The project has the potential to search for more strange objects to better understand the origin of the universe and boost the global hunt for extraterrestrial life,” Zheng said, according to the Xinhua news agency. The telescope, which has taken about five years to build, is expected to begin operations in September. Advancing China’s space programme is a priority for Beijing, with President Xi Jinping calling for the country to establish itself as a space power. China’s ambitions include putting an astronaut on the moon by 2036 and building a space station. It has begun work on the latter. China insists its programme is for peaceful purposes but the US defence department has highlighted China’s increasing space capabilities, saying it is pursuing activities aimed to prevent adversaries from using space-based assets in a crisis. Scientific achievments for future development.